I keep coming back again and again to landscapes with vivid greens. Oil paint has many options for green out of the tube and whatever you can mix from the primaries. None of them ever seem quite right but I continue to try. Spring Again is an abject lesson in getting the greens right. 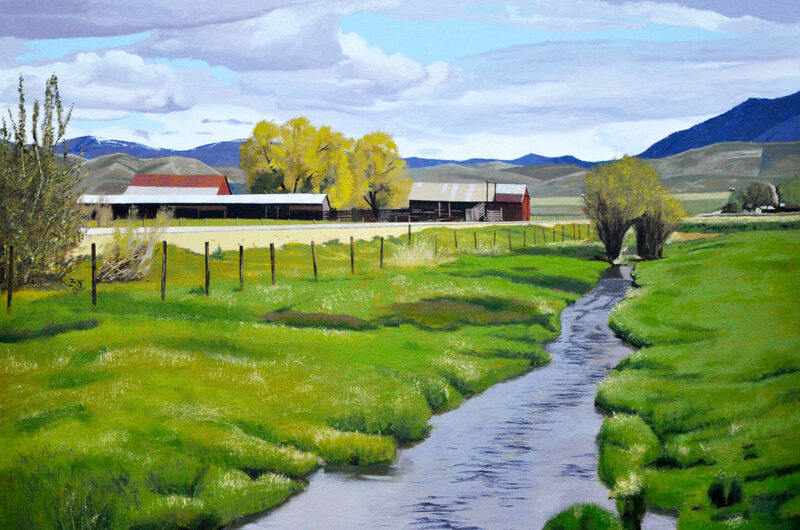 This is a landscape scene in Idaho somewhere near Fairfield. Snow melt water is in the ditches, the distant hills have not greened up and pale buds are visible in the trees. The new/old grass depicted in the foreground runs the gamut in green. I used permanent green modulated with yellows, blues, reds and other tube greens to achieve the look I show. I like how all the greens compete against the purplish tones of the sky and water. This painting has some interesting design elements as well. I like to play contrasts against each other. Not only are there contrasts of hue there is hard edge against soft edge, straight lines against curved and dark against light. To achieve this look I invariably glaze over my first direct layer of paint to unify the colors and follow it with more direct paint to detail individual areas. Lastly, I put in my lightest tones, sometimes repeating them to make them read right. I’ve found that most whites don’t stay as white as they’re mixed once they dry.